This is repeated in Jeffrey Liker’s book The Toyota Way and in many other books. Supermarkets were a self-service approach to retail sales that did not exist in Japan in the early 1950s. It was an innovation in retail sales because food shopping (and other types of retail shopping) was conducted face-to-face, with the assistance of a shopkeeper or sales associates. 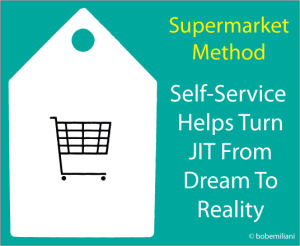 Taiichi Ohno saw the merit in self-service for the following process (customer) to withdraw from the preceding process (supplier), what was needed, in the quantity needed, when it was needed. Which story is true? Perhaps both. It is impossible to know for sure. As a historian of progressive management, I have questioned Ohno-san’s story about supermarkets in my writings (see my Foreword in Principles of Mass and Flow Production, 2009). I have long thought Kiichiro Toyoda’s story about how he got the idea for Just-in-Time was not likely to actually be the case. Toyoda-san and Ohno-san claim to have been heavily influenced by Henry Ford, though it is likely with respect to Ford’s business philosophy and hard-earned success rather than his production methods. The better influence for Toyoda-san and Ohno-san was Morris Motors in the U.K. I also have had questions about influences for the development and introduction of automatic transfer machines at Toyota. I, along with others who have closely followed Toyota, have heard stories from former Toyota people about how Ohno-san did not want to make it easy for people to understand and copy TPS, and therefore obscured the origins of some of its tools and methods, as well as how they were actually used in practice. That makes sense because TPS clearly offers great competitive advantage to those who practice it well and get better and better over time. Ohno-san knew that better than anyone else. The sources of influence of Toyota’s tools and methods, whether fact or fiction, are nearly irrelevant. What is relevant – and for which Ohno-san and his disciples, and Kiichiro Toyoda and Toyota Motor Corporation deserve our deepest respect – is that they created a new, comprehensive management method for competitive buyers’ markets. They did it live and in real-time to the core activities of a cash-generating business, not as a side project, and it has endured and improved over generations of leaders. This is an incredible accomplishment. Leaders whose organizations serve buyers’ markets should adopt Toyota’s management method for the benefit of customers and for the long-term survival of the business. Those who choose to remain wedded to the sellers’ market batch-and-queue management method invite myriad of uncorrectable problems and repetitive failures. That’s no way to lead. Taiichi Ohno’s comments about Ford in Ohno’s book are fascinating. It’s obvious he respected Ford as a visionary businessman but also gave him credit for have the ability to see “waste”. In fact, if I recall, Taiichi believed that Ford would have eventually moved away from his mass production push system to something similar to TPS if he had lived long enough.